Identify the main parts to the basic X-ray generator. 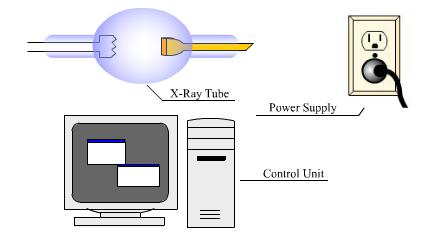 List the three things that an X-ray generator must supply in order to produce X-rays. In this section the basic construction of X-ray equipment and some different types of X-ray systems will be introduced. Most standard X-ray systems have three main components which are a X-ray tube, a high voltage power supply, and a control unit. Working together, these components are common to all standard systems. From our introductory discussion on the generation of X-rays you may recall that there were three principle requirements to generate X-radiation. These three requirements include a source of electrons, a means of acceleration, and a target for interaction. You should recognize that electrical power is necessary for X-ray generation. You already know that matter is made up of atoms, and atoms have electrons that orbit around the nucleus in shells. All we need to do is get the electron free of their orbit. How do we do this? The answer is fairly simple. If we take a piece of conductive wire and pass a current through it, the wire will heat up due to the resistance in the wire. The heat of the wire excites the electrons and they will break away (boil off) from the wire to expend the energy picked up from the heat of the current. When the energy of the electron is expended, it will return to the wire to become heated again. So this heated wire serves as our source of electrons. Why do the electrons need to be accelerated and how is it done? Our second requirement is to get the electrons traveling at high speeds. The reason we need to propel the electrons at high speeds is because the energy that the electron possesses and can transfer is dependent on its velocity. The higher the velocity of the electron when it interacts with an atom, the greater the energy of the radiation that will be produced. Propelling the electron is fairly simple. Since unlike charges (positive and negative) attract, and electrons posses a negative charge, all we need is a positive charge nearby to attract the electron. We can accomplish this by placing a piece of metal (anode) a short distance away from the wire filament (cathode). When we apply a voltage to this anode, we place a high positive charge on it. This high positive charge acts much like a magnet, only it is attracting free electrons. The positive charge will possess a strong attractive force to the negative charge of the electrons that are boiling off of the filament. This attractive force pulls the electrons towards the anode at high speeds. By increasing the voltage applied to the anode we can increase the speed of the electrons. What does the target material do? The third and final requirement is to have a target material for the electrons to interact with. By placing some sort of matter between the electrons (filament) and the positive charge (anode) we meet our need. Also, the anode itself can be used as the target. In high voltage X-ray generators a special target material (tungsten) is usually embedded into the anode. This gives the electrons a suitable material to interact with and produce x-rays. When the electron hits the target material, several things can happen. The electron can be absorbed by an atom and its energy transferred to the atom, the energy of the electron can cause another electron to be knocked out of its energy shell, or the electron may just slightly interact with other atomic particles. Radiation will be produced in all of these cases, but the energy of the radiation will be different. Modern X-ray tubes come in many shapes and sizes, normally they are of the glass or metal-ceramic tube (envelope) style. As compared to early gas filled X-ray tubes, modern tubes are of the high vacuum style. The modern techniques of tube design have allowed for smaller tubes, extended tube life, and more efficient and stable operation. The means of acceleration of the electrons is provided by applying a potential difference (voltage) across the tube anode and cathode and is independent of the voltage and current across the filament. The x-ray tube is technically referred to as an envelope. Typical construction may be from blown glass or metal-ceramic styles. Glass envelope tubes are still common today, although they have definite disadvantages to the newer metal-ceramic designs. Due to the tremendous amount of heat generated during X-ray production, glass suffers from thermal and mechanical shock. Metal-ceramic materials do not suffer damage from the excessive heat to the degree that glass does and are rapidly replacing the glass style tube. From the above illustration let's look at each of the components separately beginning with the cathode. The cathode is the negative terminal of the tube assembly and includes the filament, which is a small-coiled wire that is commonly made from tungsten. The filament provides the electrons for acceleration to the target (anode). Tungsten is metal with the desired properties for filaments, you have probably seen a tungsten filament in a light bulb before. The filament is normally powered by an alternating current that is supplied to it by a separate transformer. In many of the X-ray tubes, the current supplied to the filament ranges from a few hundred micro-amperes (symbol 109 \f "Symbol" \s 12mA) to several milli-amperes (mA). Filament current may be varied or fixed to maintain a constant tube current. Remember from our earlier discussion that the filament supplies the electrons. Adjustments in current to the filament varies the number of electrons that will boil off the filament. This in turn controls the number of X-rays that the tube is generating. Filament current controls the X-ray intensity. The positive terminal of an x-ray tube is called the anode, it serves three important functions, (1) it provides a complete circuit for purposes of accelerating the electrons, (2) it houses the target material, and (3) it helps to cool the tube. We already mentioned before that the generation of X-rays generates a tremendous amount of heat. If the heat in a tube was ignored, the target material that is embedded in the anode would be destroyed in a short period of time. The anode is typically made from materials with good thermal properties to dissipate heat. Copper and tungsten are common anode materials. In addition to using thermally conductive materials for the anode, alternate means of cooling that may be employed are gas, oil, water, or air. Does the density of the target material matter? As previously mentioned, the anode also houses the target material. As an integral part of the tube, the target requires special consideration. The target provides the means for electron interaction (bombardment). The target is commonly made from tungsten and other materials like cobalt, iron, or copper. Another important characteristic of the target material is its density. The material must be of high atomic mass for electron interaction. Remember that when the electron interacts with the target atoms the result is the generation of X-rays. Low density materials do not provide sufficient density for interaction. A high voltage power supply is an important component of an X-ray generation system. When we say high voltage supply, we need to differentiate from that of commercial electricity. Keep in mind that the filament uses a relatively small voltage supply to cause small currents (mV) in the filament, while the anode of the tube requires a large voltage supply to maintain a high positive charge for acceleration of the electrons. Commercial power is commonly available as 110 volts, 220, or 440 volts. X-ray systems require very high voltages commonly in the range from 5 kilovolts (kV) to as much as 400 kV or more. So how can we supply low voltage to the filament, and high voltage to the anode? This is accomplished by using a transformer. A transformer will allow us to supply the proper voltages to the filament and anode. The next question we need to answer would be what is a transformer and how does it work? Transformers are electromagnetic devices that allow a voltage of alternating current to be changed; the voltage may be increased or decreased. 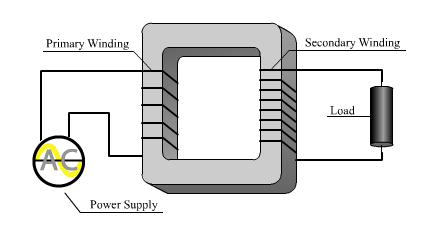 Two common types of transformers which are of importance to X-ray generation are step-up and step-down. Transformers are comprised of two sets of windings (coiled conductors) that are electrically isolated from each other. One set of windings is connected to a power supply and is known as the primaries. The other set of windings is connected to a load (in this case the X-ray tube) and is referred to as the secondary windings. The principle operation of a transformer is based on induction. If you have studied electricity, you should know that when you pass current through a conductor, a magnetic field is established in and around the conductor. This magnetic field can be used to induce a voltage and current flows in a conductive material that is placed close by. The third essential component to a standard X-ray system is the control unit. We have discussed the tube design and the power supply, now we need to know how to control the energy and intensity of the radiation being generated. There are three principle controls to a standard X-ray system, which are the current (mA) control, the voltage (kV) control, and a timer. The first two are the most important in terms of the radiation characteristics. We will briefly describe the timer control. The controls for the system are usually housed in a panel. The current control on an X-ray system commonly includes some type of a panel meter or digital display with units of miliampers (mA). The control is a rheostat connected to the circuit that allows adjustment of the current in the filament of the X-ray tube. Adjusting the current being applied to the filament results in variations in the radiation intensity. Remember that the filament provides the electrons for interaction with the target. When the tube current is varied, the number of electrons being supplied to the anode (target) varies. The voltage control on an X-ray system is similar to the current control in that it includes some type of metered display and a rheostat in the circuit. The units of the meter are usually kilovolts and the control is often labeled kV. This voltage is the electrical potential between the anode and the cathode of the tube and is referred to as the tube voltage. Variations in the tube voltage affects the energy of the radiation; penetrating power varies with the voltage. Increasing the tube voltage increases the speed of the electrons interacting with the target. Remember from our previous discussions that the energy of radiation is a function of the wavelength. Increasing the energy results in a shorter wavelength X-ray photon, which has greater penetrating power. The third control feature of an X-ray system is the timer. The timer is no different then one you set when baking cookies. It may be an analog or digital display of some sort. The function of the timer is simply to control the duration of the exposure, in other words, how much time the tube is generating radiation. It is, however, connected to the circuits of the system. When the time has elapsed, the system shuts down and no more radiation will be produced until the system is reset. The three main parts to an x-ray generator setup are an x-ray tube, a high voltage power supply, and a control unit. The X-ray generator provides three things that are required to produce X-rays, and they are a source of electrons, a means of acceleration, and a target for interaction.